A toggle clasp is one of many types of clasp that works well for necklaces and bracelets. It consists of two pieces – a ring and a toggle bar. The toggle bar slides sideways through the ring and then is pulled across the opening of the ring. A toggle ring can be any shape so long as the toggle bar fits through it sideways and is long enough to go across the center. Making a beaded toggle clasp is a great way to customize your jewelry creations and make your project unique. It is the best way to make sure your clasp will fully match your beading project. The toggle ring can be made with a variety of stitches and can even be a simple beaded loop. 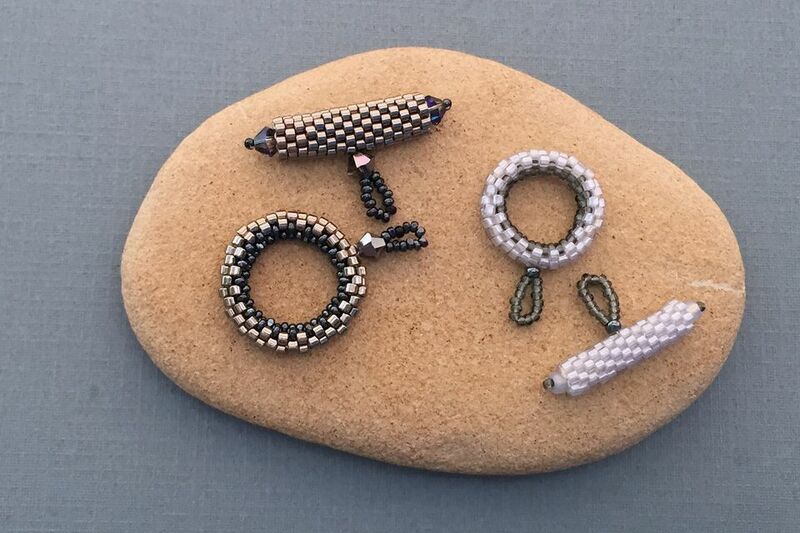 This project will show you how to make the toggle ring using tubular even count peyote stitch and the toggle bar using flat even count peyote or flat odd count peyote that is stitched together to form a tube. The toggle clasp that I will be making uses size 15 beads and size 11 delica beads. However, with a little patience and practice, you can adjust these instructions to work for a variety of ​seed bead sizes and types. As a general rule, you will need several rows of a smaller bead in the center of the toggle ring and a slightly larger bead on the sides. I have also made toggle rings with 3 different types of beads – size 15 for the center of the ring, size 11 delicas for the sides and size 11 round for the center of the ring. The other materials I am using is a Tulip brand needle in size 11 and 6 lb Fireline thread in crystal. When using size 15 seed beads, you will need to use a size 11 or size 12 needle and a thread that is on the thinner side. If you are unsure of which beads, threads, and needles work well together, this article on how to choose the right size needle and thread for your seed beads may help. You may also want some size 8 or 3-4mm bicone crystals to decorate the toggle ring or decorate the end of the toggle bar. It’s a little strange, but you will work the toggle ring by starting your beading in the center of the thread, work one side of the ring, then remove your needle and use the long tail thread to work the other side of the toggle ring and close the tube. It seems like you should be able to start on the outside center of the toggle ring, work down a side, do the small beads in the center and up the other side without removing your needle, but it comes out neater and with more consistent tension if you start with the small beads in the center and work your way up the sides. Start by stringing 40 size 15 seed beads and moving them to the center of the thread. Forty seed beads will make a ring about ½ inch in diameter. You will need about two to three feet of thread. Stitch back through the first bead to form a ring. Work one round of tubular peyote stitch with the size 15 beads. Pick up one bead, skip a bead and stitch into the next bead. Continue tubular peyote until you are back at the beginning. Since you are doing tubular even count peyote, you will need to step up at the end of each row. You will have a total of three rows of peyote with the size 15 beads, since the first strand of beads counts as two rows. After stepping up, continue three more rounds of tubular peyote stitch with the size 11 delica beads. The beadwork will begin to curl up and out from the first three rows of tubular peyote. Remove the needle and thread it on the long tail on the other side of the toggle ring. Using the size 11 beads, stitch two rounds of tubular peyote. Just like in the last step, the tubular peyote will curve upwards away from the round of size 15 beads. Once you have complete two rows, you should be able to push the two sides of tubular peyote close to each other and see how they align. Note that the size 11 beads may not be sitting between the size 15 beads. That is the way it should be since there isn't enough room. One other thing to be careful of is not to miss a bead or skip the step up. Maybe it's just me, but I always had to double check! At this point, it is going to look like there is no way the two side can join together. I always think that - but they really can! Zip the two sides of the toggle ring together by stitching through the high beads on each side of the ring. Pull the thread tight to join the sides. Continue until both sides are completely joined. The toggle ring is done, but it needs to be connected to your project. The next steps explain how to make a beaded loop, but you can also stitch the ring directly to your beadwork. There are a variety of ways to add the toggle ring to your jewelry project. One of the easiest ways is to add a loop. With the thread coming out the center of the ring, pick up enough beads to make a small loop. You can use the size 11 delica beads, the size 15 beads, or any other beads that will look good with your project. Stitch back through the first bead you pick up to make the loop stitch back into the toggle ring. Repeat once or twice more to reinforce and strengthen the loop. Weave the thread back into the beadwork, knot and trim close to the beadwork. Before trimming the thread, you can embellish the outside of toggle ring using round beads, gemstone, crystals or fire polished beads. Coming out of one of the beads on the outside edge of the ring, pick up a 4mm bead and a size 15 bead. Skip the size 15 bead and pass back through the 4 mm bead. Skip a bead and stitch through the next bead on the toggle ring. Continue to add beads in this manner until you have decorated the entire ring. The toggle bar is made from flat even or odd count peyote and then the sides are stitched together to make a peyote tube bead. Start with a two-foot piece of thread and add a stop bead. Pick up about 18 size 11 delica beads. Hold the beads over the center of the toggle ring to make sure the length is correct. You want to make sure the beads are long enough to extend over the edges of the toggle ring on each side. Work peyote stitch for around 12 rows, or until you can curl the beadwork into a tube. Again, there is some flexibility on the number of rows and it will depend on how thick you would like your tube to be. Making a slightly larger tube will give you more flexibility to add beads on the end and embellish the tube ends with crystal or gemstone beads. One important thing to note is that in order for the beads to zip together, you will need to have an even number of rows. So if 12 rows seem a little too small and 14 rows seem a little too big, you will need to decide between them. Making it 11 rows and zipping the sides up is not an option. The toggle bar can be done in either even or odd count peyote stitch. I always find even count peyote the simpler alternative, but using odd count will make it easier for you to align the loop for a clasp over a center bead. Stitch in a zig zag through the high beads on either side to close the beadwork into a tube. After zipping up the tube, your needle will end up near the tail thread. This is the perfect time to tie a square knot to secure the threads. Weave the working thread into the middle of the tube. Now you are ready to add a loop to the toggle bar. When you have reached the center of the toggle bar, pick up the same number of beads as you did previously with the toggle ring to make a small loop to attach the toggle bar to your beadwork. Stitch back through the first bead to make the loop and stitch through a bead on the toggle bar to secure the loop. Stitch through the beads one or two more times to reinforce. One thing to think about is that you always need a certain amount of room for the toggle bar to be manipulated into the center of the toggle ring. Make sure you plan accordingly because without the slack on the connector, it will be difficult to insert the end into the ring. Weave the thread into the bar, knot and trim the end close to the beadwork using embroidery scissors or a thread burner. Add a needle to the tail thread and pick up a crystal or other appropriately sized bead to cover the end of the toggle bar and a size 15 seed bead. Skip the size 15 seed bead and pass back through the crystal bead. Stitch through the center of the toggle bar and come out the other side. Pick up another crystal and a size 15 seed bead and pass back through the crystal bead. Stitch on an angle through a bead on the side of the toggle tube, bringing the needle to the outside of the tube. Adjust the end beads and pull thread taut. Weave the thread into the toggle bar, knot and trim the end close to the beadwork to complete the toggle clasp.